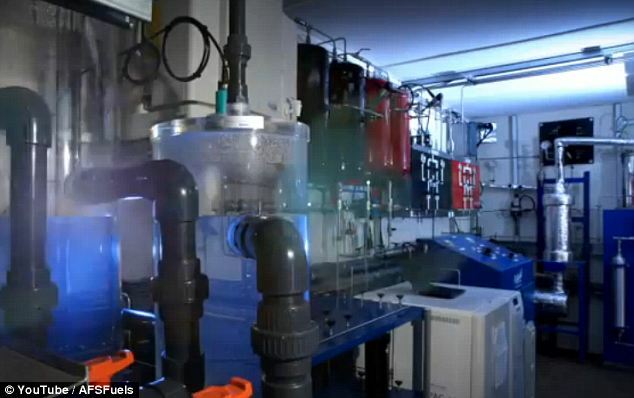 A British firm has produced the first ‘petrol from air’, it emerged today – in a pioneering scientific breakthrough that could end mankind’s reliance on declining fossil fuels. Air Fuel Synthesis in Stockton-on-Tees, Teesside, claims to have made five litres of petrol since August using a small refinery that synthesises the fuel from carbon dioxide and water vapour. Experts have hailed the incredible breakthrough as a potential ‘game-changer’ in the battle against climate change and solution to the globe’s escalating energy crisis. While the company is still developing their process and still need to take electricity from the national grid, it believes it will eventually be possible to power the synthesis entirely from renewable sources. Within two years it hopes to build a commercial-scale plant capable of making a ton of petrol a day and expand into producing green aviation fuel to make airline travel more eco-friendly. The technology involves mixing air with sodium hydroxide, then electrolysing the resultant sodium carbonate to release pure carbon dioxide. This is then reacted with hydrogen electrolysed from water to make a hydrocarbon mixture, with the reaction conditions varied depending on the type of fuel desired. The fuel that is produced can be made ready for use in any petrol tank with the addition of the same additives currently added to fuel. Alternatively it can be blended directly with gasoline, diesel and aviation fuel. Peter Harrison, the company’s chief executive, revealed the breakthrough at a conference at the Institution of Mechanical Engineers in London this week. ‘We are converting renewable electricity into a more versatile, usable and storable form of energy, namely liquid transport fuels,’ he told the Independent. 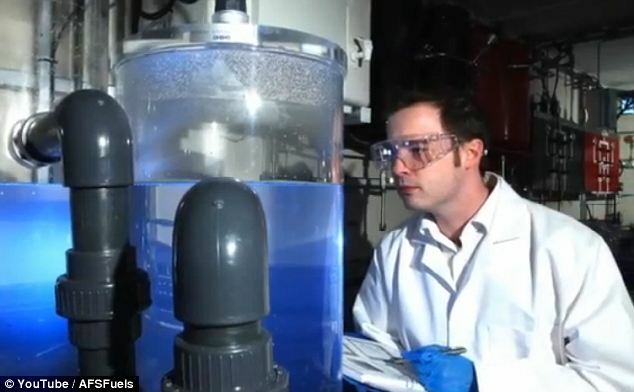 Air is blown into a tower filled with a mist of sodium hydroxide solution. The carbon dioxide in the air reacts with some of the sodium hydroxide to form sodium carbonate. This sodium carbonate is then electrolysed to release the carbon dioxide, which is collected and stored. A dehumidifier condenses water out of the same air passed into the tower, with this condensed water then passed into an electrolyser where it is split into hydrogen and oxygen. The carbon dioxide and hydrogren are reacted together to make a hydrocarbon mixture, with reaction conditions varied depending on the kind of fuel required. The product can then be mixed with the same additives used in current fuels to ease starting, burn cleanly and avoid corrosion problems. Otherwise it can be blended directly with gasoline, diesel and aviation fuel. Extracting carbon dioxide from air – effectively removing the principal industrial greenhouse gas from the atmosphere – has been described as the ‘holy grail’ of the emerging green economy. 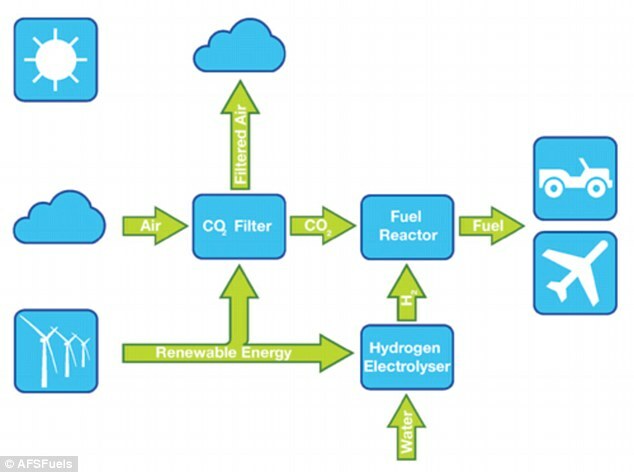 However, recycling that extracted carbon dioxide into fuel usable in existing engines has the potential to transform the world’s environmental and economic landscape. Mr Harrison said he planned to be producing petrol on a commercial basis using renewable energy by the end of 2014. Within the next 15 years the company is aiming for a refinery-scale operation, he said. Mr Fox said AFS’s small pilot plant, which he had visited, used well-known principles with the innovation being that they have made it happen as a process. ‘It uses well-known and well-established components but what is exciting is that they have put the whole thing together and shown that it can work,’ he added. As yet the process is considered too expensive to be commercially viable, with the extraction of one ton of carbon dioxide costing as much as £400. Japan cracks seabed ‘ice gas’ in dramatic leap for global energy / radically change the world’s energy outlook.